Good news! AEON (Malaysia) is running a Facebook Movie Week where they are giving away a total of 100 free TGV movie tickets! 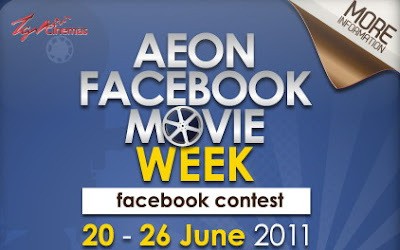 AEON Facebook Movie Week will run from 20th – 26th June, 2011. To win, all you need to do is “Like” AEON’s Facebook page. Then, look out for seven questions posted on AEON’s Facebook Page randomly. Answer correctly to win a pair of movie tickets to any TGV movie. Sounds easy enough? You also need to “Like” the posted question and be the fastest correct answer to win! Duh!!! I wonder what theme these questions will be on. Movie trivia? In any case, good luck. This entry was posted in Contests and tagged AEON, Facebook, free movie tickets, TGV, TGV movie tickets on June 21, 2011 by Cyberpartygal.